Raymond James' indie arm remains focused on advisors, their growth and recruiting, according to President Scott Curtis. Speaking after the opening sessions of the firm’s 2015 independent advisor conference in Las Vegas, Raymond James Financial Services (RJF) President Scott Curtis made it clear that the firm will not be pursuing a robo-offering, unlike Charles Schwab (SCHW), for instance. Some 1,900 affiliated reps are attending the Raymond James National Conference for Professional Development, along with more than 70 prospective reps. “That’s up from the 50 to 55 or even the 60 we get. It’s definitely a bigger number,” Curtis stated. Curtis acknowledged six of the nine Raymond James indie advisors who have been affiliated with the firm for 40 years or more during his opening talk, before highlighting the growth of the business. “The advisor count has grown 5% in the past five years, and both assets and revenues per advisor have increased by 75%-80% over that period,” Curtis explained. “I congratulated everyone on their success and encouraged them to think about what they have to do with the business to keep up with client expectations and regulations,” he added. The firm has nearly 3,400 independent reps today, down several hundred from 2005, but is “comfortable” with the success of its FA force, the executive says, and its focus on “high-quality advisors.” Average fees and commissions per advisor are about $540,000 per year. This is below the level of most of the wirehouses, where production per rep averages roughly $1 million, but more than double the level of LPL Financial (LPLA), which is at about $250,000. Curtis pointed to Goal Planning & Monitoring tools as a way the firm plans to keep up its growth. “We want to synchronize this a bit more,” Curtis explained. 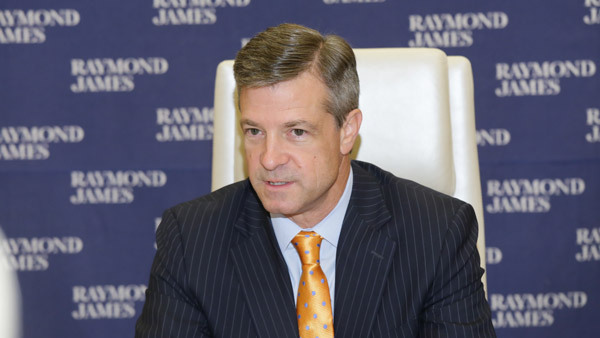 Raymond James may issue its own letter on the matter, “but there’s lots of work to be done [first],” he added. — Check out Raymond James Kicks Off National Indie Event on ThinkAdvisor.